Finding gluten free food away from the main cities is always more of a challenge. However, if you are heading north to the Inverness area and passing through the nice little town of Beauly, a stop-off at Corner on the Square deli is a must for the gluten free eater. This little deli is packed full of delicious treats to take home, including great wines, lots of Scottish gin and gorgeous cheeses, olive oils and meats. There are also tables to sit inside and enjoy some fresh, home cooked food. We stopped off for lunch after a Highlands walk and there was a really good selection of GF choices. Eating with gluten eaters, I was slightly envious of the gorgeous looking macaroni cheese with Strathdon Blue, but I was not short-changed. I had the most delicious frittata made with rocket, olives and vegetables. There was a tasty pile of salad alongside the frittata and it was just a perfect lunch. Other options included a mushroom frittata, baked potatoes and they told me they had gluten free bread, so sandwiches are an option too. The staff are very aware of allergies and take time to check what’s ok to have. The cafe is also good for vegan and stocks some completely amazing cakes. 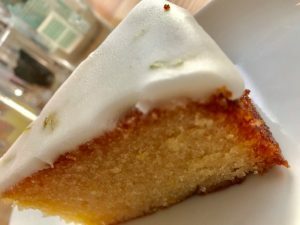 I had a really moist and zingy orange and lemon cake with lime icing, which I have tried before and would make a long detour to buy again! I resisted the amazing looking hot chocolate, which is seriously dense and smoky. The coffee is also excellent. Corner on the Square is a good place to stock up with goodies as you head off for a picnic or even a holiday and is also brilliant for the range of Scottish gins. The service is friendly and professional and there is a always a welcoming smile. The excellent greengrocers next door is run by the same family and is great too!